Even after the Army became mechanized in World War II, there were still pockets where pack and saddle animals were necessary due to mountainous terrain such as in Italy and Sicily. Mules were sent to Greece from Italy at the close of World War II. 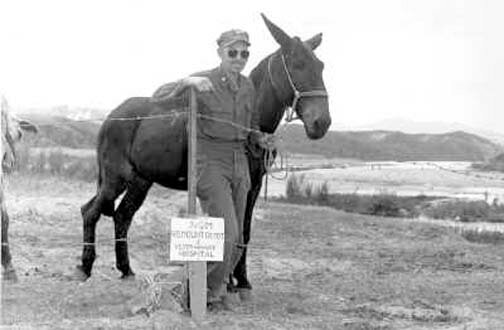 During the Greek Civil War against the Communist insurgency, The U. S. Army used 10,000 mules and defeated the Communists after a bitter war. In 1950, North Korea invaded South Korea and the U.S Army and United Nations Police Force fought the North Koreans and their allies, the Chinese Communists until a cease fire in 1953. Despite knowing the necessity of mule power in guerilla type warfare, the U. S. Army sent no mules to Korea in this conflict although the mountainous terrain resembled the mountains of Greece, Italy and Sicily. However, the North Koreans and Chinese communists did use mules and Mongolian ponies to transport supplies to their troops in the front lines. American soldiers, recognizing the value of pack mules and their need for them, captured enemy mules whenever possible. All mules captured from the North Koreans and the Communist Chinese were considered prized possessions by American soldiers liberating them and were carefully cared for! In the spring of 1951 when the Communists mounted their offensive north of Seoul, the Army 7th regiment, 1st U. S. Cavalry pushed forward with their counterattack. As the Communists were forced back, they abandoned their animals and the U. S. Cavalry troops captured these animals. The thin and sickly mules and horses (Mongolian ponies) were quickly restored to health with better feed including the cereal packets from the soldiers own 5 in 1 Small Detachment Rations, fed to them by the soldiers. On the drive north, the U. S Army moved its valuable cargo in covered 6 x 6 trucks concealing the mules. They then used these animals to transport supplies to our troops which jeeps and trucks couldn’t reach due to the rough terrain. These mules packed in rations, ammunition, barbed wire, steel stakes and even transported the wounded under enemy fire. One of the captured mules, the army soon discovered, wore a standard U. S. Brand called a Preston Brand 08K0. In tracing the brand, it was learned that this mule had been dispatched to the China-Burma-India Theater in World War II probably with the Mars Task Force. This Army Brigade served in 1944 and 45 in the mountainous jungles of Burma behind Japanese lines cutting the Burma Road and penetrating north. 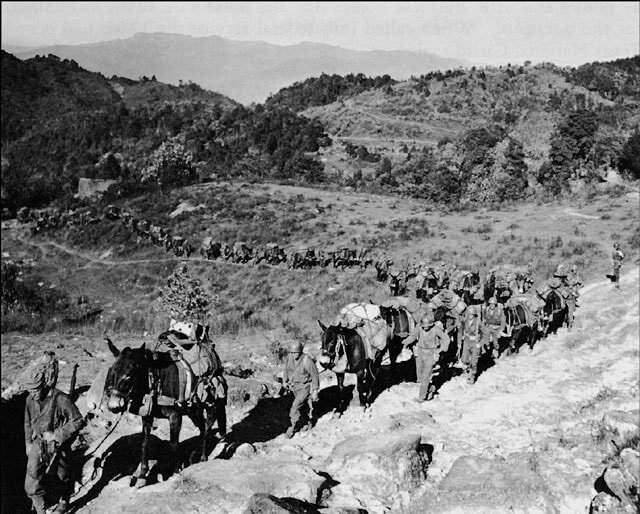 The Brigade had 3000 mules carrying all their supplies that were air dropped to them every 3 days. They had an almost 100% survival of mules with a loss of no more than 3 mule loads of supplies! Sliding off slick, steep hillsides, often mules were hoisted back up by ropes and loads were recovered by the same method. This success was attributed to the system of 1 mule leader to each mule. At the conclusion of that War, Mule 08K0 was transferred to the Nationalist Chinese Army, somehow captured by the Chinese Communists forces and now was recaptured by the Americans in Korea. At last, he was back in the hands of the U. S. Army again after more than 6 years and what a story he must have to tell! Even though the Army realized the unique value of mules, the decision had been made to deactivate the mules and horses section. By the end of the Korean War, the remaining mules were in 2 units at Fort Carson, Colorado, the 4th Field Artillery Battalion (pack). In 1956, the 322 remaining mules of the 2 units were sold or transferred to other agencies including the National Park Service and the Forest Service. Yosemite National Park received 30 of these well trained Army mules. Many of the National Forests did not themselves maintain pack and riding animals but rather contracted out their backcountry transportation needs to private pack station permitees on the National Forest. Some of these Army mules became available and pack stations acquired these experienced, well-trained army pack mules and saddle horses.